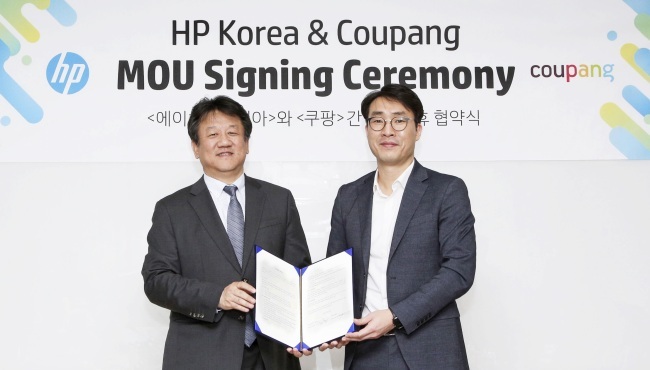 As part of its efforts to expand strategic alliance with global brands, Coupang on Thursday signed a memorandum of understanding with HP Korea for strengthened strategic partnership, the firm said. The signing ceremony held in Seoul was attended by Coupang’s CMG Business VP Dan Wright, Senior Director James BH Lee and Fellow Jonathan Burks along with HP Korea’s Country Managing Director Kim Dae-hwan and HP AP Consumer Personal Systems Director Vivian Chua. Through this agreement, Coupang can provide HP products to customers by directly purchasing from HP. HP Korea, by cooperating with the biggest online sales channel in Korea, can provide differentiated customer experience such as fast and careful delivery to customers of HP products, the company said. Coupang and HP Korea will be working on joint online marketing, product advertisement and affiliate websites. Currently, Coupang provides its overnight Rocket Delivery service on all HP product categories such as premium laptops, desktops, Omen gaming laptops, monitors, AiO, LaserJet printers, inks and toners. The two companies agreed to expand the number of items available for Rocket Delivery. “Now customers’ purchasing patterns have changed from purchasing hardware to services,” HP Korea Country Managing Director Kim said, expressing hopes to offer better purchasing experience to its customers through Coupang.